"That does Impreza me much!" With their phenomenal success in WRC rally, Subaru have really carved out a niche and created a truly easy to own practical high performance car - a sports car with 5 doors. A few of our members have been completely converted to Impreza ownership after driving one they were struck by the awesome power and handling that the Impreza offers. The large turbo, solid flat four engines have a lot to offer. There are thankfylly also many aftermarket parts around for the Impreza from suspension and handling kits and off the shelf performance flowed heads to turbo conversions, stroker kits and generally speaking the more you pay the better the return on your investment. 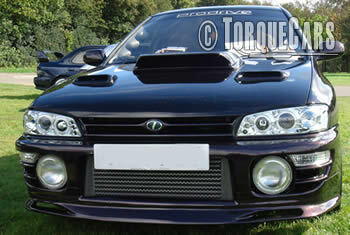 The WRX and STi both appeal to those with family obligations as they are such good all round cars. The engines are very solid and can tolerate a great deal of tuning. One of the highest performing "family friendly cars" around. Ideal for those who still want a sports car but have to be a bit sensible! There have been reports of a small problem with the early Impreza fuel pickup in the fuel tank which causes fuel starvation on long fast sweeping bends. To fix this you can fit the new design pickup/pump and these cornering problems will be gone. The flat four boxer engine is certainly one of the most distinctive sounding engines around, and the engine configuration means that the weight is carried low down in the engine bay which helps the handling characteristics. Due to the engine shape the exhausts are a work of art and the various twists and bends allow equal lengths of pipe from each cylinder. Performance exhausts cost a fortune and we suggest you get a good quality exhaust as some cheap upgrades are inferior to the OEM setup. A decent exhaust really enhances the sound of the engine and can make another 10% power gian or thereabouts. The early (1992) WRX came with a very solid and sweet sounding flat four 2.0 H4 engine block. There were quite a few revisions over the years and we see the power steadily increasing with various limited edition tuning packs from Prodrive. From around the year 2000 JDM models received regular revisions and cosmetic enhancements, with a few handling mods thrown in like the 2003 Transmission upgrade and the 2005 WRX being fitted with the better viscous rear slip differential. Other markets followed the Jap Spec upgrades and had various limited edition models introduced. Most limited edition cars were produced in very small numbers of around 400 and in most cases these were customisable by the buyer with various performance, handling and styling packs. It does pay to do your research before buying and decide which options and year model you really need rather than buying a car at random and spending your way to the spec you want. TorqueCars would recommend the following tuning modifications for the Subaru Impreza WRX and STi. Firstly the turbo can fairly easily be upgraded with one which has re-machined internals making it spool up faster and provide more boost. If you get an ECU remap done it will yield large power gains but this is best left as your final modification so you can wring out the benefit of all of the other modifications you have done to the Impreza. If you increase the power you will certainly benefit from an uprated intercooler which is mounted at the top or the hottest part of the engine by Subaru, indeed many owners of standard Impreza WRX and STi report a power increase from adding a quality front mounted intercooler. A sports cam profile will lift the power in the upper part of the rev band, however this will affect the smooth tickover of the engine so this is only really recommend for serious track day use. If you fit a lighter flywheel your engine will be more free revving and will feel more powerful. You will also certainly want to uprate the clutch although the original clutch should be good for 350 bhp, unless it is particularly worn. The engine capacity can be increased to around 2.5 litres. This should not overly affect the reliability of the engine but we would recommend a thorough testing of your block for fatigue. A sports catalyst and sports exhaust will help the breathing of the engine. Fitting the later 2.5 turbo engine is another option in your Impreza tuning project and provides a good solid base to work on.